José Andrés Red Wine Sangria ~ I Can Do That! According to José Andrés, his red wine sangria is one of the most popular drinks in his Jaleo restaurants and I can understand why. The boozy drink is refreshing and can be taken any time of the year, not just during summer. 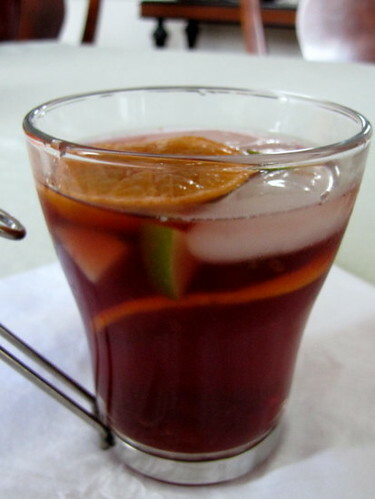 This not-your-typical sangria goes very well with Spanish food, of course. I used tiny mandarin oranges because that's what I have on my kitchen counter. The original recipe has 1 piece of peeled and sliced [regular size navel] orange. Combine the wine, brandy, Cointreau, vodka, port, orange slices, apples, and cinnamon stick in a bowl and refrigerate for 4 hours. Pour the mixture into a pitcher filled halfway with ice. Add the orange juice and soda water, give a quick stir and serve. Make sure each glass gets ice and fruit. 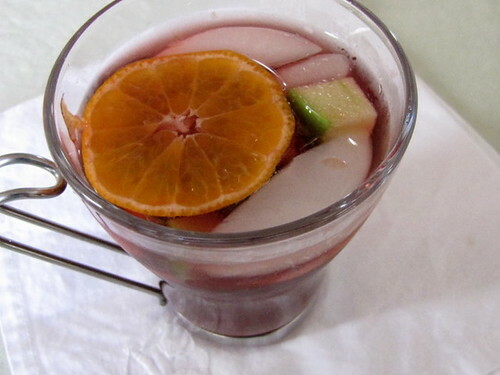 Check out José's White Wine Sangria recipe here, and a recipe for regular Red Wine Sangria here. i love sangria! more than margaritas! Praise the Lord.... I love Andres' sangria, and have wanted to make it forever. Thanks for posting this! It's been so hot and humid, and this is just the right tonic after a long week at the office!